“Salaryman” a word usually associated with what’s not Cool Japan. However, Japan Society’s new film retrospective might just provide provide an alternative view of Japan’s corporate livestock. Titled: Run, Salaryman, Run! A Retrospective of SABU’s Film Works, this film program takes a deep look at the ‘punk’n’roll’ comedies of director/actor Hiroyuki Tanaka aka Sabu. 6 of his feature films will be shown, as well as a Q&A session with Sabu in the flesh. Tickets are $12/$9 Japan Society members, students & seniors. Members can purchase the Sabu Series Discount Pass and receive passes to all 6 films for $40 (limit two passes per member). For trailers, tickets or more information, visit www.japansociety.org/film. for more info. see the press release after the jump. New York, NY – Born Hiroyuki Tanaka (1964), Sabu is the cult auteur of “punk n’ roll,” alternative comedies, often imitated, never equaled, and far too rarely shown in the U.S. since his 1996 feature debut, Non-Stop a.k.a DANGAN Runner . 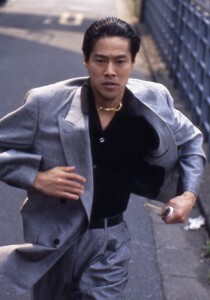 Japan Society’s Film Program now breaks the barrier with America’s first major retrospective Run, Salaryman, Run! A Retrospective of SABU’s Film Works, featuring 6 of Sabu’s 11 feature films, (a twelfth is due in 2011) from January 26 through February 5. In addition to Non-Stop a.k.a DANGAN Runner, Run, Salaryman, Run! includes Monday, Postman Blues, Postman Blues, Drive, The Blessing Bell, and the big screen International Premiere of Troubleman. Sabu makes live appearances to introduce Monday, Postman Blues, and Non-Stop, and take part in a Q&A following each of the three films. Smart, fun and explosive, Sabu delivers the high speed, high style, hard luck, and quirky lusts and lunacies of post-Bubble Japan. In a world of hazards and happenstance, he zeroes in on blue and white collar everymen tossed into dangerously absurd situations from which they desperately try to run. Speeding along at breakneck pace, Sabu brings a fresh and frantic twist to traditional film genres (the yakuza film, the thriller, etc. ), juicing their lean, clean-cropped premises with electroshock cinematic style and über edgy music scores. © 2011 The United Sounds of Superglorious. All images are copyrighted by their respective authors.